I started this year with a resolution to buy less and use more of what I already own, in creative ways. I’ve applied the resolution in our home,the kitchen and my closet. It initiated new routines. In fact, I was so succesful applying it to my closet that, around the start of March, I noticed I had a mere three sets of season appropriate clothes to choose from. A bit too minimal, even for me. So I did what I could to add body and oomph to my wardrobe. Below you will find my three top tips for frugal (and fair!) fashion, inspired by my resolution, my new routine, to use what I have creatively and consume less. Scroll down to find ways to make the most out of your own excisting wardrobe and learn how to buy smart when it’s time to shop. My 3 tips to make the most of your wardrobe. TIP 1. ADJUST what you have. Grab scissors, needles and threads and turn a dress into a two piece or a tired and ripped pair of jeans into hip and happening knee length shorts. I am planning to turn my ‘worn so much they have holes at the knees’ jeans into previously mentioned cycling shorts. I grabbed my scissors and carefully detached the top of the pictured summer dress from the skirt. I then used needle and thread to hand sew the hems of both. By doing that I upped the amounts of ways to wear the dress. I can now wear it as a dress by combining top with skirt. But I can also wear it as a top, over jeans or pants, or a different patterned maxi skirt. Or I can choose to wear the skirt, with a different top. Options are limitless! TIP 2. CHANGE THE SHAPE of your clothes. A great way to maximize your wardrobe is by changing the shape of the pieces you own. You can do this in various ways. You can use a belt (or a beltbag in this case!) to change a boxy shaped or oversized top into one that shows a waist. I turned a slightly roomy summer dress into a fitted high waist skirt, something I felt my wardrobe lacked. 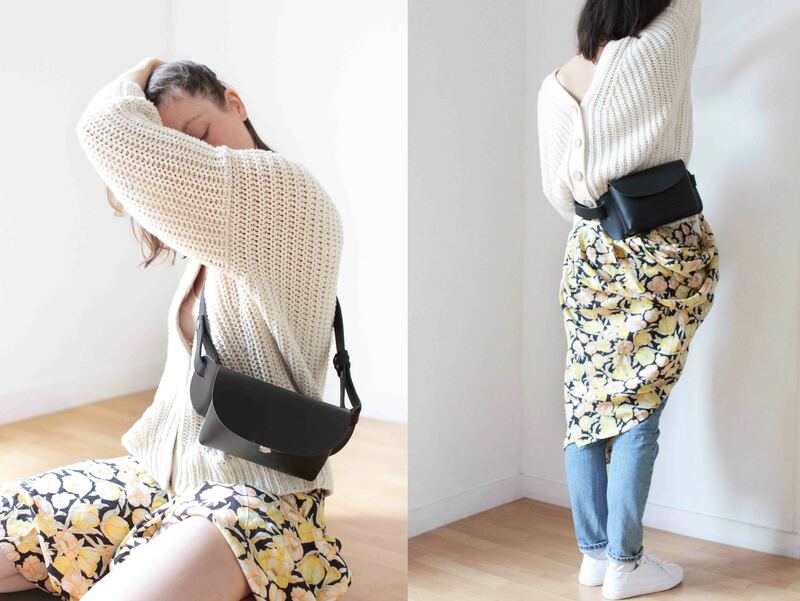 You can also layer clothes to create new shapes, like I did by wearing a billowy cardigan and a skirt over jeans, using a beltbag to around the middle. One of my favourite ways to use your clothing smart is to turn them around. Cardigans turn into sweaters with beautiful backs by wearing them back to front. I love high collars and low backs in t-shirts and shirts too. They are all able to change shape according to your desires and needs. Open your drawers, pull out your tops, put them on and turn them around. 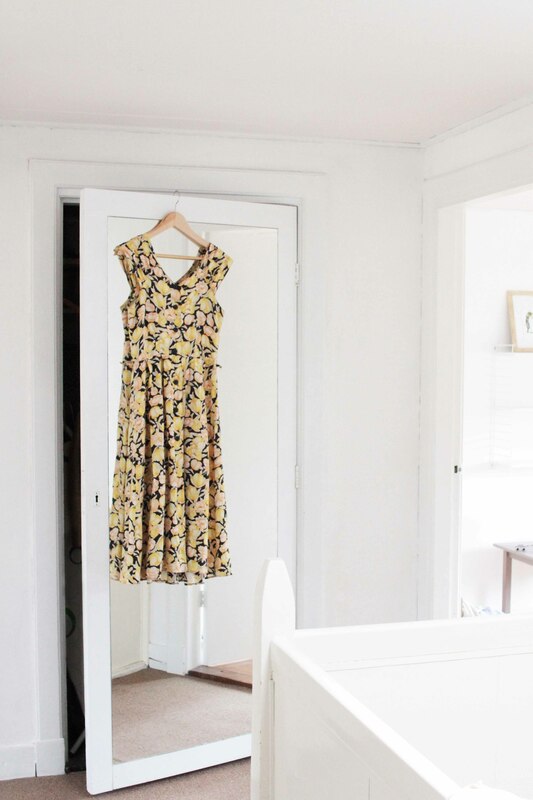 See how a simple deed like this changes their look and adds depth and versatility to your closet. TIP 3. INVEST in versatile pieces. Choose versatile and classic colours: neutrals that go with everything. When you spend a bit more on quality basics you lay a fantastic foundation for a lasting wardrobe. Quality keeps, which is in my opinion the true meaning of sustainable. And what good is being frugal when you have to keep buying because the cheap stuff you bought so frugally tears and disintegrates after the first wear? Or even worse: is not loved and not worn at all because the only reason you bought it was because it cost next to nothing? I found one with a very similar pattern over at Stine Goya. Or what about this one I’ve been drooling over! Or what about these floral dresses by Christy Dawn? I am also crazy in love with everything BLANCHE does, denim-ly. Or how about all of the gorgeous sustainable basic cardigans MASKA makes? Mine: by LUMI. This beltbag made from vegetables tanned, naturally dyed and chrome free leather. So here’s a little beltbag story. First of all, who would have ever thought fanny packs would come back in style?! Not me, that’s for sure! But you know what? I found myself really loving this style. 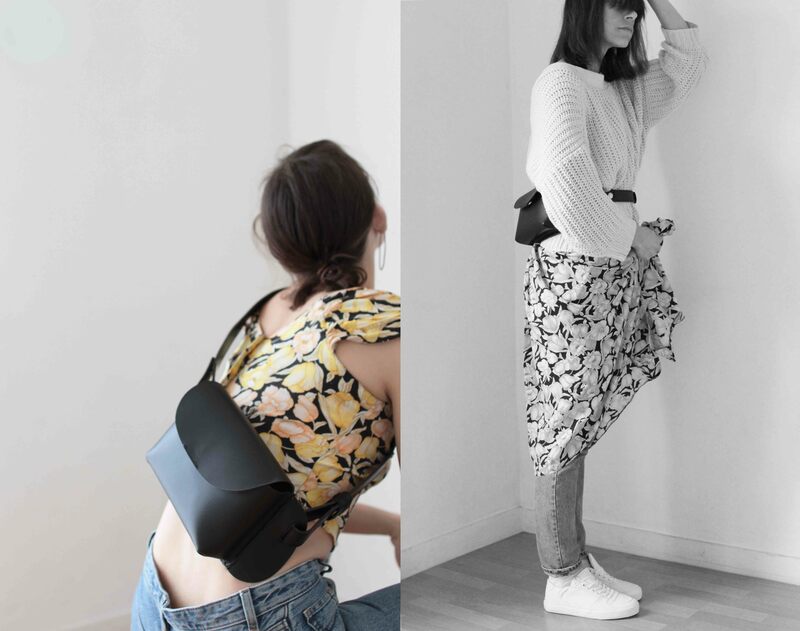 Fanny packs, aka bumbags or beltbags, are extremely, i repeat EXTREMELY, versatile and practical. I wear mine cross body front and back. I wear mine at the waist. I wear mine at the hip. I also swing mine over my shoulder. My beltbag has a detachable belt so I can up the amount of ways to wear it even more by adding a different coloured or textured belt. Because I am a mama to two I need to have my hands free as much as possible. Clutches are cute but don’t work for me as a daytime purse, but beltbags do! I can have Sami at one hip and my beltbag at the other. Another crazy fact, I haven’t owned a black bag in years and now that I do I am really unsure why I did not choose one before. Mine looks good with about everything and anything. Bless the power of basics and neutrals! My Finnish friends over at LUMI offer you a whopping 25% discount (nice and frugal ; ) on an item of your choice. Simply use the code KYRA25 at check-out. Purchases need to be made before April 10th 2019. Head over to HERE to view all of LUMI’s styles. Note: LUMI’s slogan is #loveitkeepit and I could not agree more! Buying smart, consciously and deliberately, choosing the things you really and utterly love only, will ensure you purchasing pieces you will enjoy for years and years to come. When buying, choose wisely. Mine: Collective Canvas. O my lawrrrrrd, this brand is the coolest! Read about them here! These white eco sneakers by IGWE look amazing too. Or for those who wish too shop vegan: how about these by Sydney Brown? Similar ones can be found at TOAST and Steve Mono. *Affiliate and gifted. LUMI kindly gifted me a bag of choice. I chose the Alina beltbag because I love it, would have also bought it myself and plan to wear it till the end of times. LUMI and I have a wonderful collaborative relationship and I adore their roots, sustainable products and ethical message. LUMI offers you a discount. I receive a small percentage for every purchase made through the code shared. Thank you for supporting fair and sustainable brands like LUMI, when life requires you to shop and put some new clothes on your bod. 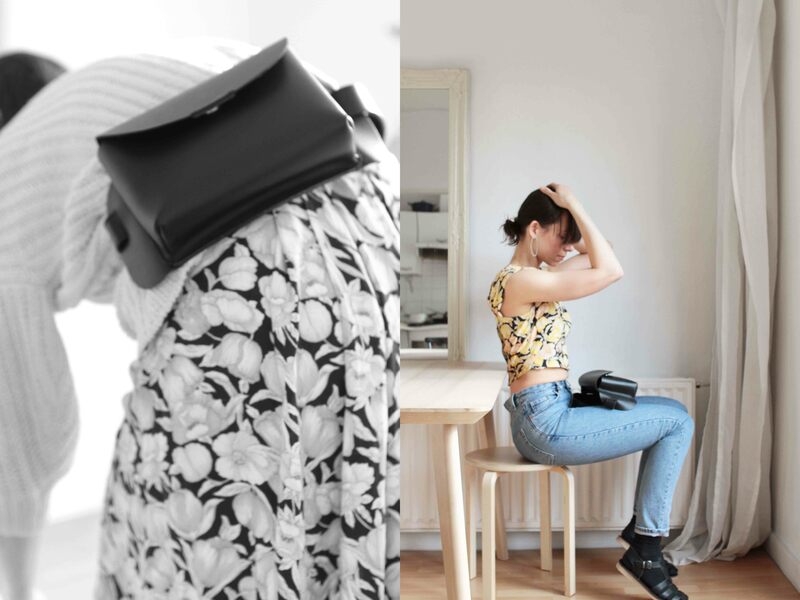 It’s friend brands like these that make journal posts like this one possible!